“OK?” I could hear my sister passing the phone and telling Brady that Aunt Jennie is on the phone. “I saw… I saw Dominoes!” Brady shouted into the phone. “You saw Dominoes?” I asked to clarify. “I’ll push you!” Brady says, jumping off his own swing to go behind Troy. “OK?” Troy responds, doubtful of how this is going to work. He “pushes” and Troy starts to move, in large part because Troy is making it happen with his feet. The swing and the much larger child start gaining some momentum. Unfortunately, Brady’s timing is a little off…and…Whack! Brady goes flying backward into the wood chips. Where do the pencils belong? I carried my almost four year old nephew as we walked out of his brother’s jujitsu practice. Hmm…Don’t know what to say to that one…I guess you’re right? Good thing he wasn’t looking for a response, he was too busy shouting goodbye to all the other kids! 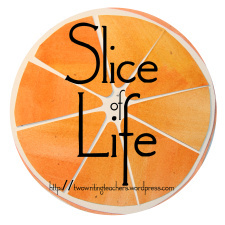 Posted on March 2, 2018 March 2, 2018 Categories Slice of LIfeTags Aunt Jennie, slice of life6 Comments on Where do the pencils belong? Troy is the most amazing child I have ever met. I realize that I am biased, but he is special. I need to remember that regardless of all of the mistakes I have made and will continue to make, he is a good kid. I want to continue to encourage him to be himself: that creative, unique boy, mismatched socks and all. A Library! I want a library in my house! It needs to have lots of high shelves, filled with books. And a ladder! A sliding ladder! I will have one of these one day! “I love crazy!” Do you know where this is from? Frozen. Toward the end of the school year my co-teacher and I were listening to Disney Pandora when I heard this line. Immediately I said, “That is what I we need! Well…we each need separate guys that like our kind of crazy.” (or something like that) And so, I will settle for nothing less than someone who loves my kind of crazy! OPEN is my One Little Word for 2016. If you don’t know about this idea, I would suggest looking into it. It has honestly changed me much more than any resolution I have ever made. If you are a teacher, you know why this is part of my virtual vision board. Standing up for what you think is best for the kids isn’t easy, but I can’t stop questioning. “Be Someone’s Crazy Aunt!” I think I’ve got this one covered and, coincidentally, I just got confirmation this weekend. I was at my grandparents house and so was my sister, brother-in-law, and two nephews. I got up to get something to drink from inside and my four year old nephew took my seat. So, of course I made a big deal of it, sat next to the chair, and stuck my feet (my bare, stinky, dirty feet) in his face. He looked at me and said, “You’re weird!” SCORE! Use Your Words: I just finished this book yesterday and it has been so motivational and though provoking. It is a symbol to keep writing, make time for it. More posts about this are in progress! We spent the day at Brookfield Zoo with my sister, mom, and two nephews. It amazes me how everyone sees the world differently. The same moment, the same view, provokes different thoughts in each person experiencing it. My four year old nephew focuses on the facts about the animal: Look at it walking! Where do they live? What do they eat? My mind is thinking two things at once. I see the giraffe and feel guilty. Guilty that I can roam the world and she is stuck inside this fence. Simultaneously, I am listening to these two beautiful, very different boys voice their thoughts. I am enjoying this moment, despite my guilt. I am lucky to have these boys in my life. Posted on March 30, 2016 March 30, 2016 Categories Life as a Mommy, Slice of LIfeTags Aunt Jennie, SOL3 Comments on What do you see? They sat at Ma’s kitchen table, playing with dinosaurs and blocks. “I’m your mommy! I’m your mommy!” the four year old repeated, getting increasing louder and screechier. Oh…the joy of being publicly embarrassed by a three year old…One day I will get my revenge. One day his crazy Aunt Jennie will embarrass him…That is a promise!